Kumbh Mela is the largest spiritual gathering (or possibly for that matter – gathering) around the world. The tradition of Kumbh Mela is centuries old. Every 12 years a full Kumbh and every 6 years a half Kumbh is arranged. The roots of the tradition lies into the ancient Indian (Bharatiya) literature which is often referred to as mythology. According to medieval Hinduism, Lord Vishnu spilled drops of Amrita (the drink of immortality) at four places, while transporting it in a Kumbha (pot). These four places are identified as the present-day sites of the Kumbh Mela. Arranging a huge festival like Kumbh Mela is a herculean task. The latest Kumbh Mela was arranged in Prayag aka Prayaagraj. It was Ardh-Kumbh and was arranged in early 2019. It is said that crores of visitors have visited this Kumbh and the arrangement made by the government with the support of many organizations and volunteers was remarkable. 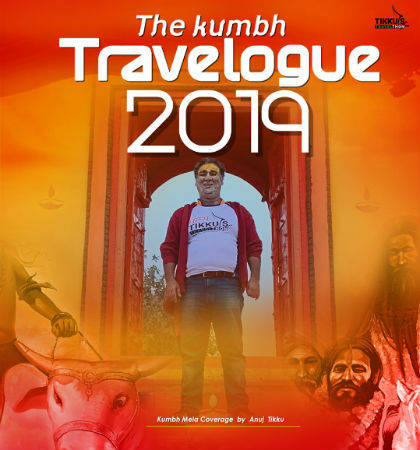 Anuj Tikku – a travel blogger from India has visited this Kumbh with a few purposes. The first one is, visit this spiritual gathering and pray for the lost souls and get inner peace. The second one is the curiosity to visit such a large gathering first hand and capture and document some aspects of the same. And yes, promoting his own website or better to say – brand. We must say that Anuj got a nice design team and his book covers are getting better. Here are quick links to his other books we got a chance to read and share our reviews for. The cover page shows Anuj at Kumbh and the saffron color used on the cover pages reflects the spirit of the Kumbh. An attractive cover page. While in most of the cases our book reviews are distinguished clearly into two segments; “The Plot” and “Views and Reviews”, this book has a different canvas. While a lot has been written about Kumbh Mela and some stunning pictures of the same are made available by government and non-government sources; this is the first-hand account by a visitor. And, thus you can expect unbiased coverage of Kumbh Mela from this book. The way it talks about the layout of the city, arrangement, traffic, crowd, food and other stuff, is quite real and neutral. I like Anuj’s idea of Ek Ka Dum, Ek Kadam which he has implemented in partnership with an FM channel. Anuj and his team of volunteers kept earthen pots with them and approached people to donate 1 rupee. He then decided to get those sealed earthen pots in front of the DM of the area and give it to him, to be used for cleaning the Triveni Sangam after the Kumbh Mela is over. This is a nice and thoughtful gesture. One rupee is a very small amount and people will definitely agree to donate it by knowing the cause. And, definitely, after so many visitors visiting the place, a high-level cleaning drive must be required. Whatever help the citizens can offer, will help the authorities. Ultimately, it is our responsibility to preserve things. It would have been even better if the author could have shared the photographs of him giving the earthen pots to the DM of the area. It adds to brand honesty. We don’t see marketing people revealing their business tactics. Anuj tried to be honest here. And, he clearly mentions that this will be a great marketing opportunity for him. In fact, the first chapter of the book is about blogging and making money. He got a remarkable number of T-shirts with his brand logo printed and distributed during the Kumbh. I like his honesty when he talks about visiting a food joint and convince the owner for web advertisements. Anuj promoted the food joint and in turn, they gave them free food. So this is a win-win situation for both of them. Anuj also insists bloggers to use this kind of tactics to earn money from their blog. The book touches Anuj’s emotional side also. The way he felt when taking dips into the river Ganga is something I would like you to read in the book, rather than talking about. With the many face paintings and Chandan facemasks, my beauty therapy was happening at almost free of cost. Here I was getting the real turmeric face paks for less than 20 bucks. You will get to know more about the city (Prayagraj)in the book and the author also talks about his experience of watching Hindi Film Manikarnika there. The book has formatting issues. While one can understand that it is not easy to format a picture book to suit the Kindle layout; the editor could have taken care of the same. Some of the photographs look stretched, especially in the first segment of the book. There are places where space is missing between words. Also, the chapters of the book could have been better arranged. They seem haphazardly arranged. The book price may also be a factor to discourage many readers (especially from India) from purchasing the book. Some of the photographs are repeated at places and you may often think that they are just placed to make the book a picture book. As the author has a vast collection of pictures he could have used different photographs. Also, UP CM Yogi Adiytanath is referred as Adi Yogi Nath, wrongly. The word “Shraddh” is referred as “shred” in the book, may be a result of some autocorrection. The word “Aghodi” used instead of “Aghori”. Overall, a picture book which could have been a better resource if formatted better and lesser price.